Confidence Chakra Magic candle is Sunny Yellow, 2" dia. x 4.5" tall, 40 hour burn time. A fresh blend of Cedarwood, Frankincense, and Juniper bring back the power to your solar plexus chakra. When you say, "omg, I need a hero." 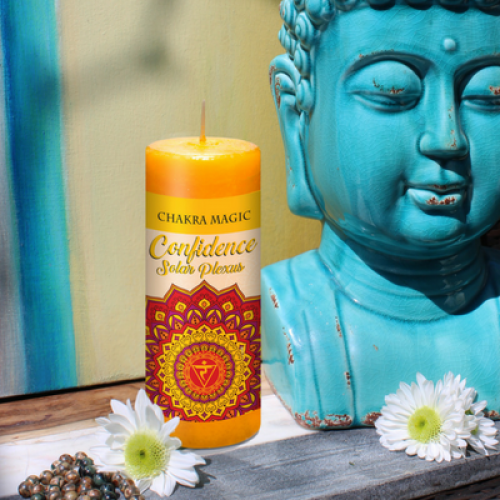 It's time for a solar plexus chakra shift with chakra magic candle and get your confidence back. Confidence Chakra Magic Mantra I am a little ray of sunshine filled with joy and enthusiasm for life. I thought I needed a hero and now I know that hero can be me. I accept that life is what it is and I will let each success and failure build my confidence. With every breath I take, I believe in me. With every breath I take, I trust me. With every breath I take, I trust in the process. A 4 oz spray bottle with mister. A blended oil of date and bergamot. Spray on or around yourself fo..
A 4 oz spray bottle with mister.A blended oil of amber musk and peppermint sage. When the small thi..
A 4 oz spray bottle with mister. A blended oil of sandalwood, myrrh and jasmine. Be the Ninja and s..
A 4 oz spray bottle with mister.A blended oil of frankincense, lemon grass and juniper. Clear a pat..
A 4 oz spray bottle with mister. A blended oil of Dragon’s Blood fragrance. Dragon’s bl..
A 4 oz spray bottle with mister. A blended oil of lavender, patchouli and orange blossom. A room sp..
A 4 oz spray bottle with mister. A lavender blend. Lavender is known for its amazing properties on ..
A 4 oz spray bottle with mister. A blended oil of Sage and Rosemary Our most popular spray! The sag..
Jasmine is a blessing to humanity from the goddess; it is as if she smiled upon all of life and turn..
Frankincense releases a powerful vibration to clear negative energy, purify the spirit, and consecra..
Amber is an ancient petrified sap that still retains a subtle scent. The scent and energy of amber r..
Often associated with male energies or the sun, Cedarwood is useful in spells for money draw, and it..
Cinnamon can be used in just about any magical work, because it ads a bit of extra strength to all s.. Date is used for fertility spells, and is most often worn or carried for this purpose. It also prote.. Lavender seems to be the go-to oil in cases of love and spiritual growth. The key to lavender is its..
Peppermint can be used for everything from healing and happiness to love and money draw. To protect ..
Rose is the essence of peace and tranquility. Rose embodies love and romance and draws love of all k.. Put this oil on your money candles or sachets as a boost of good luck!.. Although another evergreen with properties similar to fir and pine, juniper has some unique magical ..
Myrrh helps one understand the nature of being spiritually aware. It not only assists in expanding y..
Patchouli oil contains a grounding scent that connects you to the rhythm of life and attunes you to ..
Sage is second to none when it comes to cleansing ones self spiritually. Sage is also used in money ..
Sandalwood raises energetic vibrations to a higher level of spirituality. Sandalwood defers negativi..
Sweet grass is treasured by the Sioux, Cherokee, Blackfoot, Lakota and other native American peoples.. Vanilla has been used as an aphrodisiac for centuries. It is also used to help one through a creativ..